Family Structure: Children who lived with both biological parents were less likely to get drunk (25.4 percent of those living with cohabiting biological parents and 26.6 percent of those living with married parents). 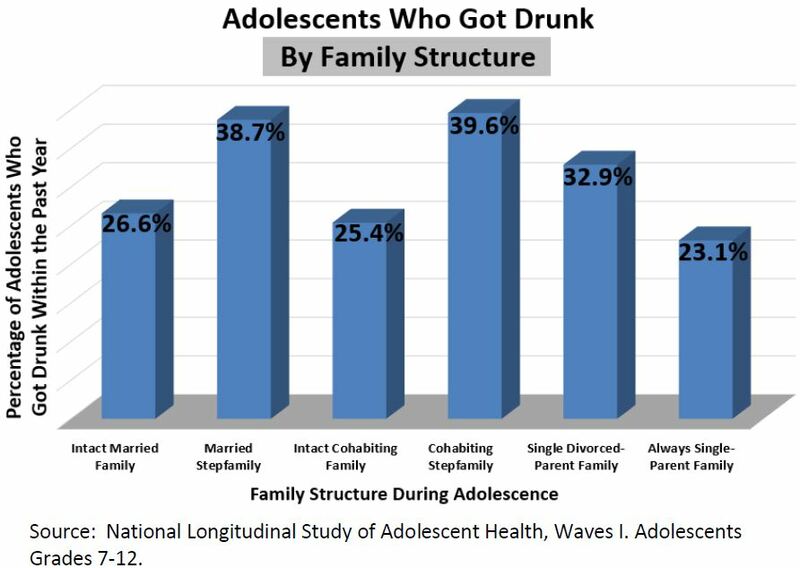 Nearly 33 percent of adolescents whose parents were divorced got drunk in the year prior to being surveyed, and for those living with a step-parent or only one biological cohabiting parent, the percentage increased to 38.7 and 39.6, respectively. Just 23.1 percent of adolescents whose parents never married admitted to getting drunk within that timeframe. 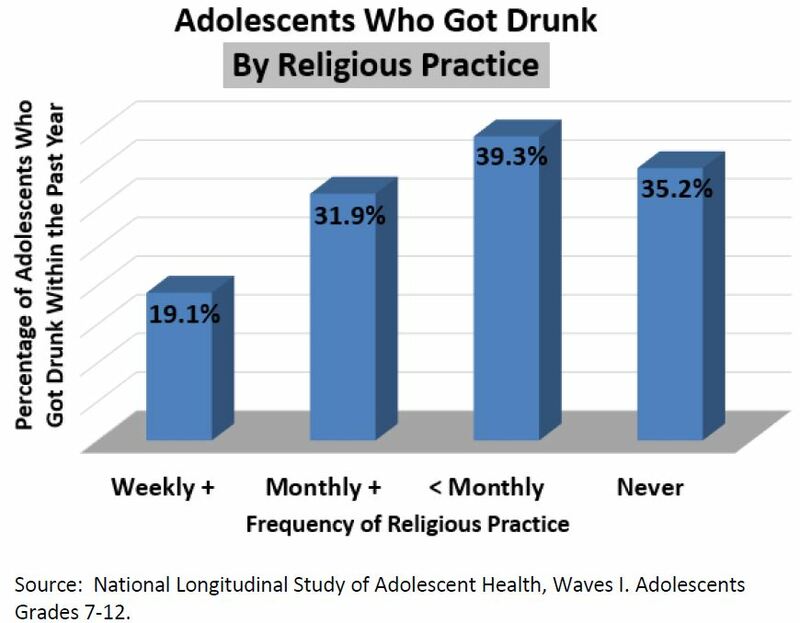 Religious Practice: 19.1 percent of students in Grades 7-12 who attended religious services at least weekly got drunk in the year prior to being asked. By contrast, 35.2 percent of adolescents who never worshipped, 31.9 percent of those who worshipped one to three times a month, and 39.3 percent of those who attended religious services less than once a month admitted to getting drunk within that timeframe. 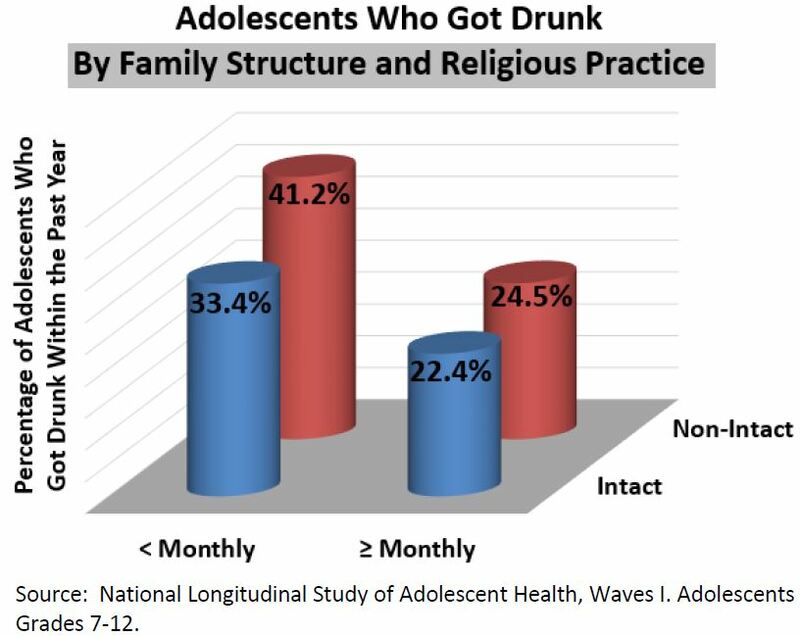 Family Structure and Religious Practice Combined: Only 22.4 percent of adolescents who lived with both biological parents and worshipped at least monthly had abused alcohol. By contrast, 41.2 percent of adolescents who worshipped less than monthly and came from single-parent or reconstituted families had abused alcohol. In between were those in non-intact families who worshipped at least monthly (24.5 percent) and those who lived with both biological parents and worshipped less than monthly (33.4 percent). Alex Mason and Michael Windle of the University of Alabama at Birmingham reported that adolescents who had close familial bonds “were more likely to be religiously committed and involved” and that this religious commitment and familial support were both directly related to less alcohol consumption over time. In a study of adolescent students in British schools, Ian Sutherland and Jonathan Shepherd of the University of Wales College of Medicine found that 31.4 percent of students who frequently attended religious services regularly used alcohol regularly, compared to 68.3 percent of students who did not attend religious services, and that “[a]dolescents without religious convictions were…2.8 times as likely to drink alcohol.” They also noted that 59.4 percent of students from intact families regularly used alcohol, compared to 65.9 percent of those from non-intact families. The data indicate that the intact family that worships frequently is most protective against the abuse of alcohol among minors. There is no statistical difference between these two data sets. Roy F. Oman, et al., “The Potential Protective Effect of Youth Assets on Adolescent Alcohol and Drug Use,” American Journal of Public Health, vol. 94 (2004): 1425-1430. W. Alex Mason and Michael Windle, “Family, Religious, School and Peer Influences on Adolescent Alcohol Use: A Longitudinal Study,” Journal of Studies on Alcohol, vol. 62 (2001): 44-53. I. Sutherland and J. P. Shepherd, “Social Dimensions of Adolescent Substance Use,” Addiction, vol. 96 (2001): 445-458. This finding is from www.familyfacts.org.